Now that our run for the nut has ended in the super heavyweight quarterfinals, we've updated IceBerg's web page to include his four victories over Sharp Tooth, Half Gassed, Bucky the Beaverbot and No Apologies, before losing to Little Blue Engine. 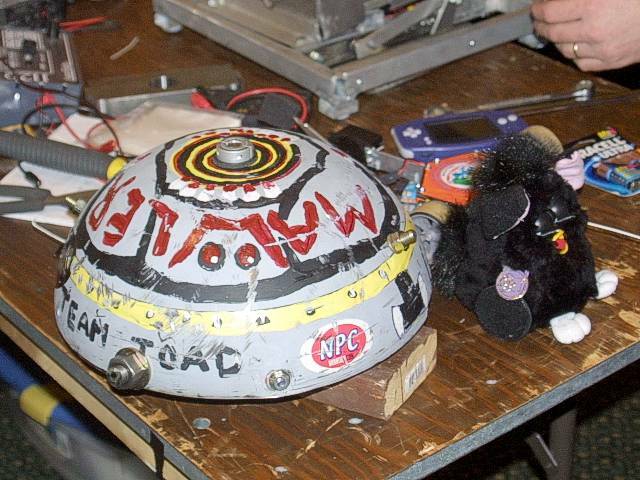 This is the second time a Team Toad robot has reached the quarter finals (the first being FrostBite 1.0 in Las Vegas, 2000). Now that the girls have finished writing their science projects, "Tire Choices in a Fighting Robot" and "Battery Endurance in a Fighting Robot", we finally started uploading frame grabs from Season 4.0. See the Season 4.0 Toad Stickers page. See also our new "Virtual Toad" technology for inserting Toad Stickers into the program as needed. See our Super heavyweight robot IceBerg on Television next Tuesday, Feb. 19th on Comedy Central's BattleBots at 10PM EST. We've also updated SnowCone's web page to show some of the preparations for HSRC'02. For women, only, we're announcing the Official Team Toad Watch out Boys! T-Shirt. The prototypes are in, and we're assessing interest for the big batch order. Finally, see IceBerg on TV next week, February 12, at 10pm. We reorganized the Toad Sticker page by season, and for the first time we reveal our initial experiments with a Sticker Bot. We also have an updates to FrostBite 3.0's page, including a description of our dramatic loss to Surgeon General, and a photo of the gouges left in our spinning weapon. Lots of Team Toad news. FrostBite was on TV last week, losing to Surgeon General in a spectacular fight. We've already turned our attention to HSRC'02, the next NERC competition in Philadelphia, PA in March of 2002. 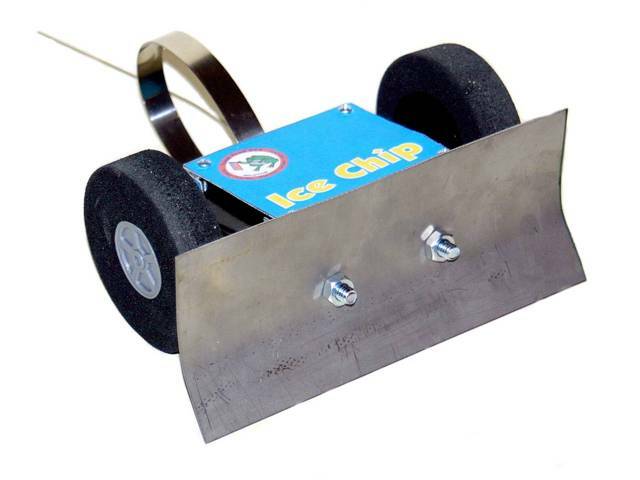 Kelsey built a new antweight called Ice Chip for her seventh grade science fair project, "Tire Choices in a fighting Robot", and has entered the little copy of Ice Cube as a real entry. 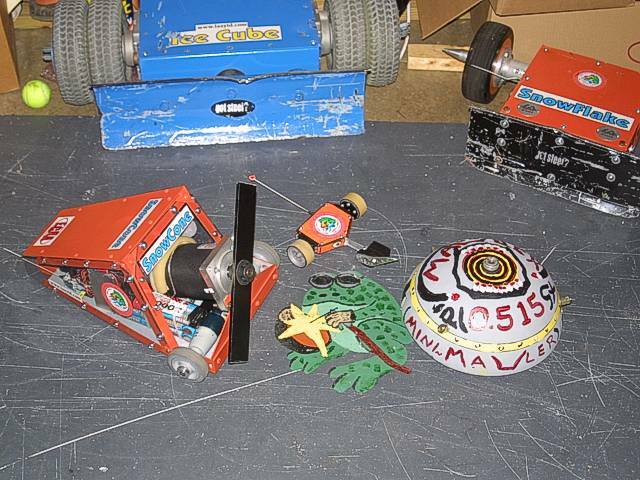 Check out the Robots page for more information about all five NERC entries. Our first Team Toad robot to appear on TV is SnowFlake, our daughter Jacey's robot. Jacey added one KO to her record this season, and then lost to the two-time lightweight champion. See more on the SnowFlake web page. 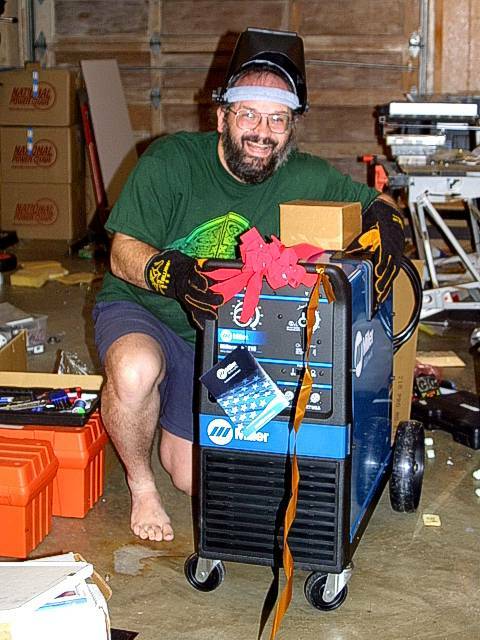 We had a good Christmas, and Debbie got Fuzzy a Miller MIG welder for Christmas! Have I got a great wife, or what? See Team Toad on TV! Watch Comedy Central's BattleBots on Jan. 8 and Jan. 22 at 10pm EST. SnowFlake will appear as the last fight of the first episode of Season 4.0 (Jan 8 at 10pm EST), and FrostBite will appear as the first fight of the third episode (Jan 22 at 10pm EST). And keep watching Season 4.0 for future appearances. We've updated the description of IceBerg's Pneumatics to show the changes for the newer V1.0 safety rules. We've also updated our TI-2 event report to include a few pit photos. We're back home, the bots are in crates wending their way home, and now we're in that least favorite period of the BattleBots season: NDA time. We've put a few photos in FrostBite 3 and IceBerg's pages. We'll be adding lots more photos to our TI 2 event report, after I get my sleep schedule regularized. Okay, we had lots of fun with smaller robots over the summer, but now it's time to get ready for "the Show". With 5 bots coming, we have all sorts of changes, from just new kill-switches for the smaller bots, a totally new FrostBite, and massive retrofitting to IceBerg, we don't have a lot of time for web page updates, but we did put up a report showing IceBerg's new lid. We got tired of hearing nothing but reports about how powerful everyone's weapon is, so we decided to report on our new defensive armor. Almost an inch of Lexan and stainless steel. Now that we've gotten all 5 Team Toad BattleBots registered for Treasure Island, we figured it was time to post a build report. The kids' robots are all going to return pretty much unchanged, and IceBerg is still up in the air, but we've made lots of progress on FrostBite 3.0. We also finally got some good closeup pictures of TadPole. Okay, we're back from CJRC, and we had a great time, albeit with mixed results. TadPole is still the reigning ant champion, undefeated in 9 matches. See our CJRC 2001 Event Report. Well, we, made it. With the help of Phere, we got at least one Toad Sticker in every episode of season 3.0. Thanks to all the robots and crewbots who kept us from disappearing entirely from this season. Okay, we're back from iHXRC, and we had a great time and made a great showing. See our iHXRC Event Report. To top that off, we also discovered that Toad Stickers invaded London, thanks to Tim Berghoeffer and General Chompsalot. TadPole, Mini-Mauler and SnowCone are all tweaked, tuned, tight and ready to fight. Okay, we have frame grabs from episodes 3.8 and 3.9, and we still have Toad Stickers in every episode so far. Just one more to go. Okay, Mini-Mauler is ready for iHXRC, and Debbie's SnowCone, having passed its driving weapons test, is getting a new Titanium top. Okay, Mini-Mauler is ready for iHXRC, and Debbie's SnowCone had its first driving weapons test. Now that the heavyweight results are in, we can talk about FrostBite's fights; detailed fight reports will come later. Briefly, FrostBite knocked out Circuit Breaker, and lost a split decision to Hexadecimator, bringing FrostBite's career record to 3-2. We are making one more entry for iHXRC in Chicago on Sept. 8 & 9th: a 30 pounder called SnowCone to be driven by Debbie. Thanks to Phere, Wyachi, and Rim Tin Tin, we're seven for seven in Toad Stickers on TV. Also, since Comedy Central revealed the Lightweight quarter-final brackets, we can now publish our SnowFlake fight report. Alright, no fights or updates, yet, but we have Toad Stickers in all six episodes, so far. 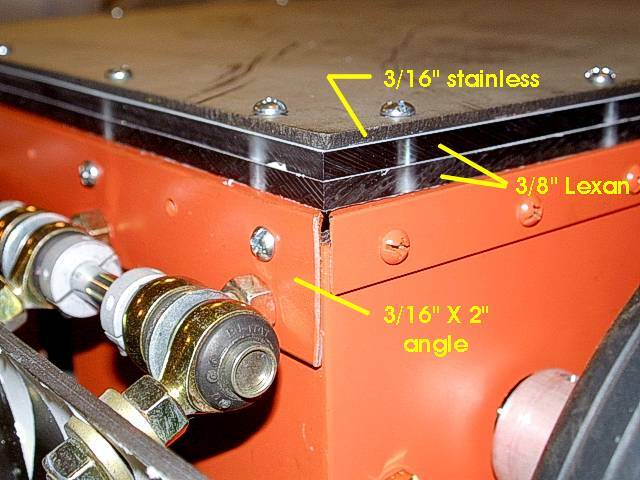 We have an update to Danny's Bio page, showing his first TIG welding lesson from Rob Everhart. We also have two new photos on our Toad Sticker page. We have a fight report on IceBerg's page describing its first round loss to the Judge, as well as new photos of each robot and team on the robots page. We have uploaded frames grabs of Toad Stickers on TV from all five episodes of Season 3.0. We have updates to WindChill and TadPole's pages, as well as a new team photo on our, Team page. Also, we have uploaded frames grabs of Toad Stickers on TV from the first two episodes of Season 3.0. We painted Mini-Mauler today. Just a few more tweaks, and it'll be ready for iHXRC. We had our first weapon's test of Mini-Mauler today. We have a Quicktime movie (5.4 Mb) on our video page. We had our first drive test of Mini-Mauler today. We have video of the drive test on our video page. Team Toad will be attending iHXRC in Chicago this September. 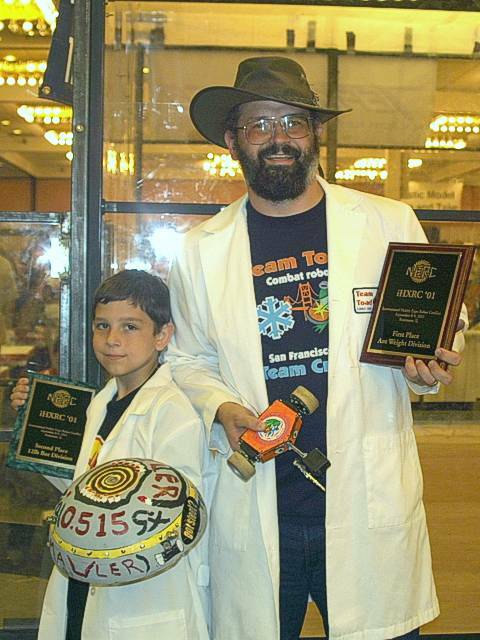 We're building two robots, an antweight called TadPole and a 12 pounder called Mini-Mauler. Danny actually got SC Tilford's permission to make a miniature Mauler for this event. Back from our 3 week safari tour to Africa and Europe for the Total Solar Eclipse, Team Toad proudly presents Toad Stickers around the world. Now that the event is over, we can finally reveal IceCube's secret weapon, a spring steel rear hoop that replaces a static wheelie bar. That coupled with dual quickie tires protected by 7075 aluminum hub caps and the speed of the NPC 64038 motors made IceCube a huge success. Of course, the real secret was Kelsey's ice cool killer driving instinct. Team captain Debbie and driver Kelsey coordinated nicely in matching Team Crystal tops. It's over, and we're back. On the Hertz Rental Car Tram, we sat with Lenny and Anthony (the producers) who told us that Comedy Central will start the new season in July. Thus begins the excruciating phase of BattleBots: waiting until you can talk about your fight(s). We have a few photos in our SFO 2001 trip report's page, including a really cool screen background-sized photo of the pit area as seen from the overhead interview area.